TVs don't come in just 3 or 4 sizes so why should TV stands? With ours you get to pick the width, the depth, and even the height! You can also tell us how many drawers, if any, you want it to have. You even have your choice of hardware!! Our cherry TV stands are finished with a hand rubbed natural oil finish. Our hard maple TV stands are finished only with a clear finish. Our red oak TV stands come in a traditional Golden Pecan stain. 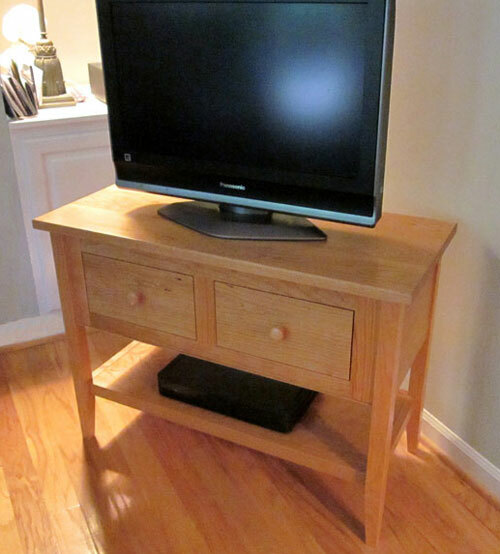 Our white oak TV stands come in 9 beautiful stains. 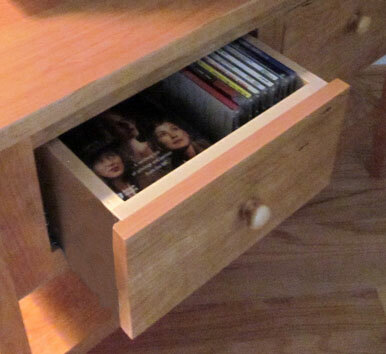 The solid cherry media stand pictured above is 36" wide, 16" deep, and 26" high, with two dovetailed 6 1/2" high drawers large enough to hold your DVD's. Our media stands are strong enough to hold the heaviest of TVs. The prices below are only samples. We build everything to order so we can build your media stand the exact size and with the exact features you need. A 50% deposit is due at time of order with the balance due when your item is ready to ship. Some assembly required unless you make arrangements to pick it up. Shipping typically only costs $125. 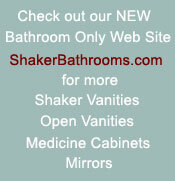 - where you live (you may be able to get our TV stands locally!) Here's Why!